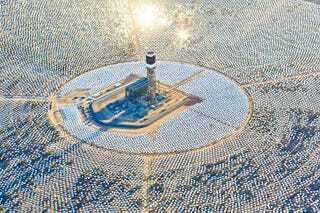 You're looking at an astonishingly huge and gorgeous solar energy plant that's being built by Brightsource Energy, an American firm, in the Negev desert. It looks like something out of Star Trek, but it's actually from Earth's near future. The Ashalim power plant will be located in the Negev desert near Kibbutz Ashalim south of the city of Be’er Sheva, and when it’s completed in 2016 it will be the biggest solar power station in Israel with enough capacity to power 40,000 homes. The new solar station is being developed by Megalim Solar Power — a joint venture between U.S.-based solar power company Brightsource Energy and French power and transport company Alstom . . . The BrightSource-Alstom Megalim plant is one of three projects at the Ashalim site, which will generate 250 MW of electricity at full capacity – that’s enough to cover 2.5 percent of Israeli energy consumption. When all three projects are online, Ashalim will become the fifth largest solar power station in the world. Read more, and see more images, at Inhabitat.